An early encounter with the wall kept Ryan Blaney and the Motorcraft/Quick Lane team from achieving the result they were hoping for in the season-ending Ford EcoBoost 400 at Homestead-Miami Speedway. But as Blaney and the team head into the off-season, the future looks much more encouraging. Team co-owner Len Wood said the 2016 season has been a great learning experience for Blaney and his young crew, and that will pay dividends in the future. The future also looks promising for Wood and his family-owned team, which just completed its first full season on the circuit since 2008. At Homestead, Blaney qualified eighth for the premier event of Ford Championship Weekend, his 12th top-12 start of the season, but he struggled from the start of the race. He bounced off the wall, bringing out the race’s first caution flag at Lap 28. The Motorcraft/Quick Lane crew made repairs, but the damage was more serious than it initially appeared, and he hit the wall again after blowing a tire on Lap 208. Still, he and the team soldiered on and wound up with a 26th-place finish. But as he and the Motorcraft/Quick Lane team closed the book on his rookie season, he was able to find some positives despite the disappointment of the season finale. He ended the year with three top-five and nine top-10 finishes. Blaney and the No. 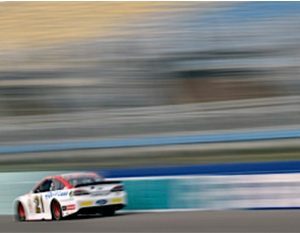 21 Motorcraft/Quick Lane team kick off the 2017 season at Daytona International Speedway next Feb. 23-25.